You will find that the natural habitat for the Polar Bear is in the very cold areas of the world. They live in the Arctic region where the temperatures are low, the water is cold, and they are able to move around on thick sheets of ice. They survive in very isolated and remote locations where humans very rarely will be found other than the small colonies and tribes that are native to these areas. In the past few decades there have been sightings of Polar Bears in locations that are closer to human civilizations. They include areas of Canada, especially around the St. James Bay area. 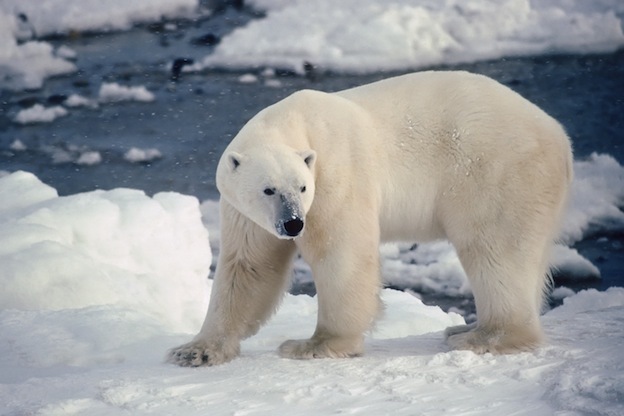 Polar bears have a very wide range that they roam in these areas that they reside in. It is believed that they have more of a range than any other large sized carnivore in the world. There are plenty of Polar Bears out there in zoos around the world as well. They seem to do quite well in captivity. Many people are surprised though that they are able to adapt to such a warm climate at many of these zoos. One thing you will notice is that they don’t have the same weight as those in the wild. It isn’t due to a lack of diet but rather they don’t need the extra layers of fat underneath to keep them warm as they do in their natural habitat. Large male polar bear on the shore of Hudson’s Bay. In the wild, Polar Bears are known to live for up to 25 years. They don’t tend to be susceptible to a variety of diseases and viruses out there like other species of bears. It is very hard for researchers to know why Polar Bears die in the wild. They aren’t able to find their remains very often to explore in detail what happened. It is believed that as these Polar Bears get older though they get weak and they get slow. As a result it is harder for them to catch the food they need in order to survive. It is also believed that due to the aggressive nature during the mating season, the males are very likely to die from their injuries. They may not be able to hunt due to their injuries or to consume food if many of their teeth have been broken in such altercations. Mishaps such as oil spills also adversely affect their food supply in a given habitat location. The females are more selective about their habitat and that affects their distribution. The reason for this is that they need to find a location where they can create a den to protect themselves and their unborn cubs from the rest of the world. This den needs to be large enough for them to remain in for several months after birth as well. While a female may find the food to be plentiful in a given area, if she can’t find a great place to make her den there she will continue to move on. The fact that so much of the land out there around these waters is being used for other purposes becomes a problem. There is a great deal of stress for a pregnant Polar Bear that isn’t able to find a place to create a den when she needs to. This can result in a low birth weight of the cubs or her losing them before they are born. There have been some reports of these female Polar Bears having to improvise. As the distance increases between the pack ice and the coast, pregnant females must swim longer distances. While not an ideal location for giving birth, it may be the only location they can find that may offer them and their cubs a chance of surviving.